The USA-NPN has been successful in large part due to the committed efforts of several key individuals, including Dr. Mark Schwartz and Dr. Julio Betancourt, together with strong institutional support from the US Geologic Survey and the University of Arizona and the collaboration of many partner organizations. The inspiration for a USA National Phenology Network (USA-NPN) had several origins. In 1956, Joseph Caprio at Montana State University initiated lilac phenological research in the United States. He developed a network of over 2500 volunteer observers reporting from 12 Western states. Joseph Caprio’s program stimulated development of a similar program in the Eastern USA in 1961, initially under the direction of W.L. Colville from University of Nebraska and had ~300 observers in 1970. The Eastern network lost funding in 1986, but was continued by Mark D. Schwartz at the University of Wisconsin-Milwaukee at ~40-50 stations. The Western States Phenological Network was terminated upon Joseph Caprio’s retirement in 1993, but was reactivated at a handful of sites by Dan Cayan and Mike Dettinger, both affiliated with the U.S. Geological Survey (USGS) and Scripps Institution of Oceanography, to complement studies on the timing of snowmelt discharge. Today, the lilac dataset, and the Spring Indices derived from it, are delivered for novel scientific research. At the turn of the century, Mark Schwartz envisioned a revitalized and broad national network that would extend phenological observations to additional species. 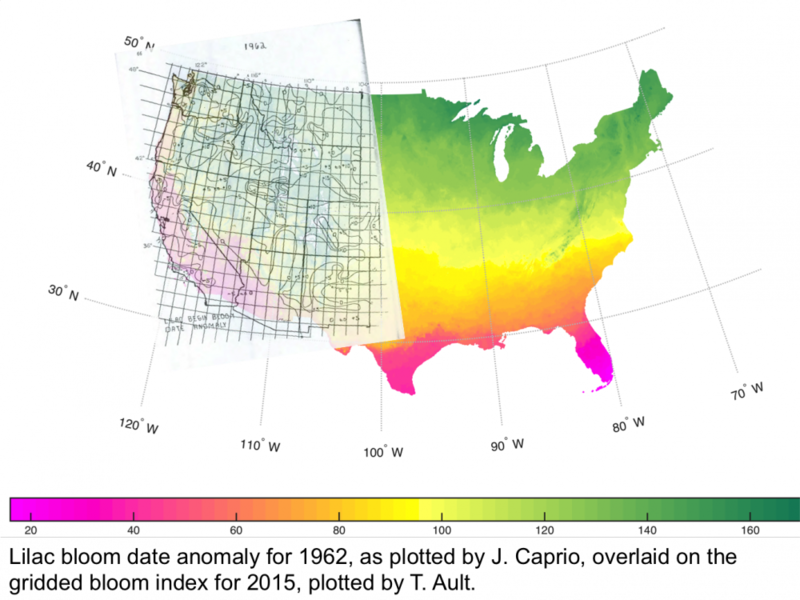 In 2004, Julio Betancourt at USGS independently arrived at the same conclusion after co-chairing an American Institute of Biological Sciences Grand Challenge Workshop that explored the National Ecological Observatory Network (NEON)’s role in studying ecological responses to climate. Betancourt teamed up with Schwartz to organize a spatially-distributed network to achieve continental coverage of phenological observations in collaboration with the intensively-sampled regional nodes at NEON. Mark Schwartz and Julio Betancourt led several planning and implementation meetings, which led to the funding of a five-year National Science Foundation, Research Coordination Network grant in 2007 (NSF Grant # 0639794). The USGS and the University of Arizona (UA) established a cooperative agreement to found the National Coordinating Office in Tucson, Arizona. The USGS hired Jake Weltzin as the USA-NPN Executive Director. Through a series of cooperative agreements, the USGS provides the majority of the financial support for the USA-NPN, while the UA provides office space and administrative support for the network through the School of Natural Resources and the Environment. A Board of Directors, led by Mark Schwartz (Chair) and Julio Betancourt (Vice Chair), provided guidance to the USA-NPN National Coordinating Office (NCO) from 2008-2011, when the Board was transformed to an Advisory Committee. The Advisory Committee, comprised of 12 individuals from agencies and academia, was led by Chair Geoff Henebry and Co-Chair Mark Schwartz, until 2015.